Our most versatile summer jacket, the LRX Air 2 jacket features Cortech’s Aquatherm™ two-stage waterproof liner and 100g polyfill thermal liner. 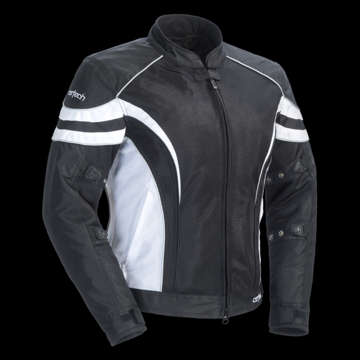 When the temperature rises these liners easily remove and the Armor-Link 3 mesh shell makes sure the rider stays cool in even the hottest conditions. 600 denier Carbolex® material and CE-approved armor in the elbows and shoulders keep the rider safe from abrasion and impact. Adjustable take-up straps at the bicep and forearm help to adjust the fit and keep the CE-approved armor fitting snugly. • Includes Cortech’s removable, two-stage Aquatherm™ liner: The two stages can be used in conjunction with each other or independently.